Schweinfurt military community, part of "The Big Red One", makes up the 280th Base Support Battalion which is attached to the 98th Area Support Group out of Wuerzburg. The major command is the United States Army Europe with a primary weapon system of combat arms. The community is split between 2 barracks or kasernes (Conn and Ledward). 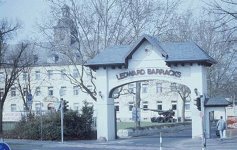 Both barracks are located in the city of Schweinfurt and are approximately two miles apart. Located in the heart of Franconia, the city offers an enchanting array of picturesque buildings, beautiful parks, outdoor markets and numerous recreational facilities. Schweinfurt is centrally located in Germany, just 99 miles east of Frankfurt and 72 miles northwest of Nuernberg. If you want to explore your surroundings even further, countries such as Switzerland, Austria, France, and Belgium are only a few hours drive away. The First Infantry Division is charged with the vital mission (as a part of the NATO Defense Team) of maintaining the forward edge of freedom in Western Europe. To carry out our mission, we support a population of approximately 12,000 including 5,004 active duty Army, 12 active duty Air Force, 149 US civilian employees, 478 Local National civilian employees, 6,185 family members, and 93 retirees. Opportunities for armored maneuver training of US forces in Germany are limited, given the problems of small and restrictive local training areas, low OPTEMPO allowances, and ongoing requirements to support contingency operations such as that in Bosnia. In a move to provide more training opportunities close to where units are stationed, two local training areas were targeted for modifications to allow more maneuvers by armored platoons and companies. Schweinfurt and Friedberg Training Areas are large enough to accommodate such maneuvers, but thick forest cover currently limits maneuver space and lines of sight. The Schweinfurt military community consists primarily of two kasernes (barracks), Conn and Ledward. North of Wuerzburg, along the banks of the Main River, lies the city of Schweinfurt. The first documentation of the city's existence was in 740 A.D. Schweinfurt was almost completely burned in 1554, but was rebuilt during the Renaissance (14th-16th centuries). Schweinfurt's industry dates back to the end of the 18th century when a dye plant was started. Even today there is a shade of green widely known as "Schweinfurtgreen." In 1853, the first pedacycle (a forerunner to today's bicycle) was built in Schweinfurt by the firm that is now the largest ball bearing manufacturer. The manufacturing of ball bearings established Schweinfurt as a major industrial center and also led to the city's destruction in a bombing raid in 1943. Today, Schweinfurt is an industrial city with 50,000 residents. The present four ball bearing factories employ some 28,000 people. Other local industries include machinery, leather, sugar, chemicals, soap, bricks, beer and wine. Also located here are a number of printing firms, and iron and steel plants (one of which manufactures the "Iron Lung"). The beautiful Franconian countryside offers many opportunities for enjoyable and interesting tours and day excursions. These include ancient Mainberg Castle, Bad Sennfeld and Werneck Castle, the summer seat of the Prince Bishops of Wuerzberg. An hour south of Schweinfurt, the city of Rothenburg sits overlooking the Tauber River. One of the best preserved medieval towns in Germany and the only remaining completely walled-in city in Germany, Rothenburg remains little changed from medieval times. A little over an hour southeast of Schweinfurt lies Nuernberg, the second largest city in Bavaria. Nuernberg was a great imperial city dating back to the year 1040. The town was almost totally wiped out by air strikes during World War II, but has been restored to a large extent. Nuernberg is the location of one of Germany's oldest Christkindlesmarkts, the famous Christmas markets. Besides offering a wide range of shopping, Nuernberg boasts a picturesque zoo and majestic Gothic churches. Wuerzburg is located just 30 minutes southeast of Schweinfurt and offers many sightseeing opportunities, including churches, cathedrals, the Fortress Marienberg, and the Prince Bishop Palace. Wuerzburg is called the Hub of Germany as it is the junction of the most important motorways in Germany. There are 6 highway exits out of Wuerzburg. They lead to the Netherlands, Belgium, Austria, Italy, Scandinavia, and Switzerland. From Schweinfurt's central location in Germany, Europe is easily accessible - from a walk along the Seine in Paris (5 hours away) to skiing the Austrian alps (3 hours away), a stroll through Holland's tulip fields (6 hours away) to shopping for crystal in the Czech Republic (3 hour), seeing Michelangelo's statue of David in Florence, Italy (8 hours) to buying pottery and baskets in Poland (6 hours).